I've been in Japan for three days now, so I'm going to start writing up my experiences as and when I have time to spare from actually experiencing them. The rule is that adventures take priority (temporal, logical and moral) over their recounting, so there may be some gaps - but, like last year, I want to get things down as close to the tiime they happened as possible, to counteract issues of memory leakage... I'll probably hop back and forth quite a bit, but that's the way of memory. At least it will be gorgeously illustrated, courtesy of Japan. Unlike last year, when strong winds almost cost me my connection in Amsterdam (and did cost twenty-four hours without luggage), this time I got out just ahead of the impending storm, at a moment when the bombers and hijackers were on their tea break, and the journey, though long, was pretty uneventful. On the plane from Amsterdam I switched back and forth between The Tale of Genji and the live-action version of Attack on Titan. The first was very enjoyable, in unexpected ways which I would illustrate with a few choice quotes were I not pressed for time and afraid of trying your patience (albeit I reserve the right to try it on a later occasion). The film wasn't a patch on the anime, sadly, which was no doubt not a patch on the manga, such being the general way of things, but it passed a couple of hours in a long flight. Despite our being the only English speakers on board, all the announcements made by the cabin crew were repeated in English, which I'm sure is standard procedure but felt as if it were done especially for our benefit, or rather for mine, my Alabamian companion being fluent. This felt a little embarrassing, somehow, and I reminded myself that I would need to thicken my skin against such moments in the days ahead. Anyway, we landed at Kagoshima - right in the south of the southernmost of Japan's main islands - and I was met there by my friend Chiho. Chiho's generosity with okashi has been extensively documented in these pages, but she is in any case (which I already knew but was to learn tenfold over the next couple of days) an exceedingly kind and generous person, and just the best fun to be with. She was also extremely tactful in helping me with my Japanese, which I appreciated, while in return I did a little Britpicking of her English - which she wishes to learn in the British variety, having been taught American English at school. We began just outside the airport by soaking our feet in the wayside foot spa there (towels are provided, 100 Yen each in the honesty box - ah, Japan!). 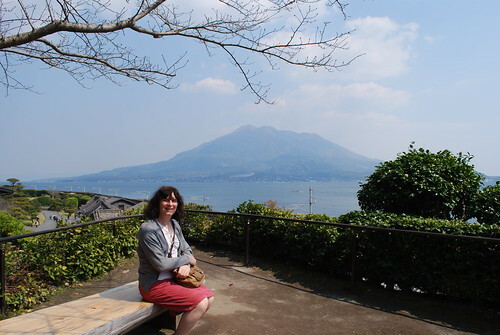 The water of course was toasty warm, having been piped straight from the volcanic springs that pock Kagoshima, and it made a wonderful start to the holiday proper, given that I'd had my shoes on for the previous 24 hours. Kansai bloody awful, enjoy trip. Our city's airport is also "international," which in our case means you can catch puddlehoppers commuter flights to northern Mexico. All of which depart from the (very small) international terminal -- none of the flights from the main concourse fly any further than Seattle or Boston. That's a great photo. I love the classic framing with the tree branch and a real volcano in the background! Oh, it sounds fabulous so far!